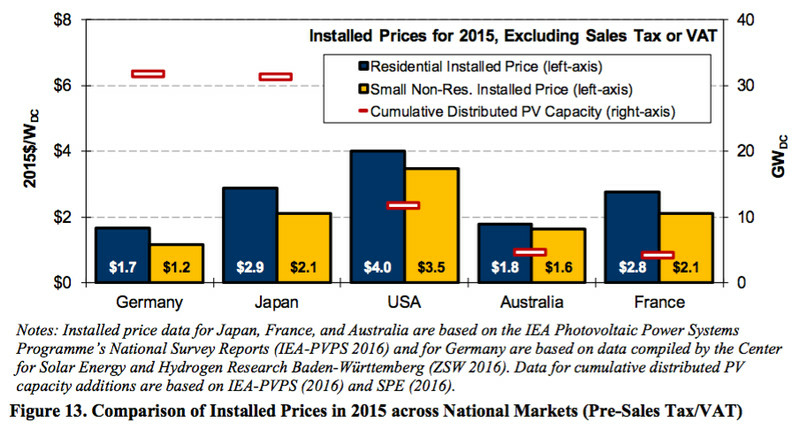 Prices are falling for both big and small solar, though at different rates and for different reasons. 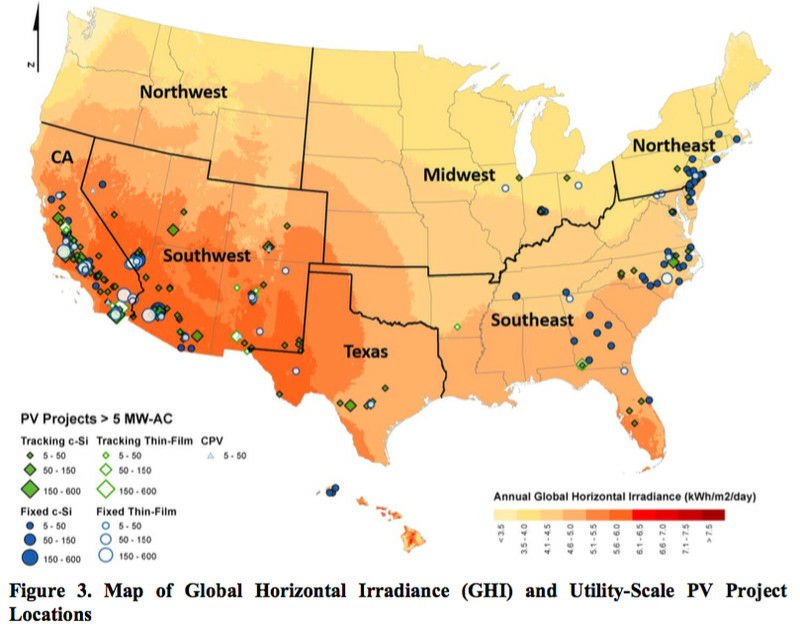 There are also a few concentrating photovoltaic (CPV) plants, which use lenses to concentrate light on PV panels, and a few concentrating solar power (CSP) projects, which use mirrors to concentrate sunlight on towers with steam generators. For our purposes here, we can mostly ignore them, since their growth has been dwarfed by PV’s and PV is expected to dominate growth for the next several years. This chart is unnecessarily complicated — I’m not going to get into the debate over whether to measure costs via DC or AC — but the thing to notice is that the lines go down. Installed costs are falling each year. More and more dots over on the East Coast! 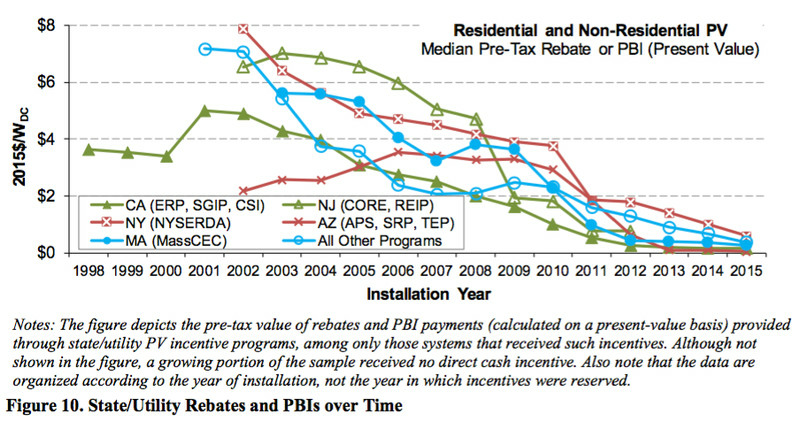 Second, PPA costs are falling: “As recently as 2011, solar PPA prices in excess of $100/MWh were quite common. 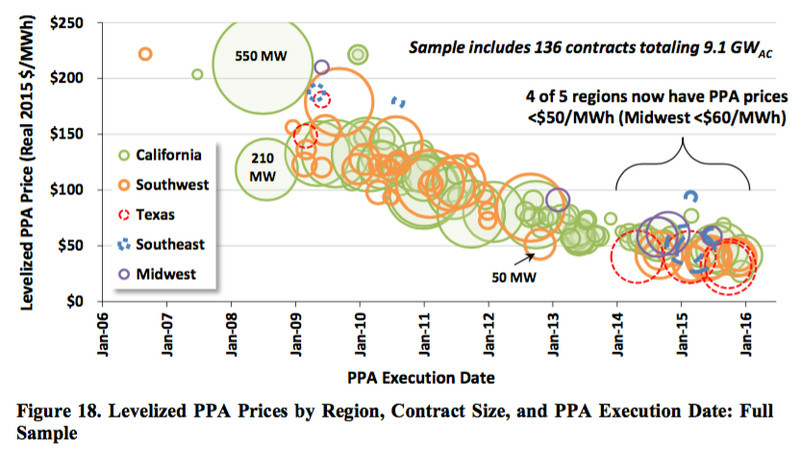 Barely five years later, most PPAs in the 2015 sample are priced at or below $50/MWh levelized (in real, 2015 dollars), with a few priced as aggressively as ~$30/MWh.” From $100/MWh to $50/MWh in four years. Not bad. And fifth, utility-scale solar is reaching prices, especially in California and the Southeast, that are competitive with local wind power (and cheaper at certain times of day). Natural gas is still so cheap that solar has trouble competing with existing plants, but when it comes to new gas plants, solar is getting within striking distance, especially if gas prices rise more than forecasted. No one really has a clue what gas prices will do, of course, which helps highlight the fact that solar’s stable, fixed, long-term contracts can serve as a valuable hedge against volatile fuel prices. Small-scale (under 5 MW), distributed solar falls into three categories: residential rooftops, nonresidential systems under 500 kW (think commercial rooftops), and nonresidential systems between 500 kW and 5 MW (think small, ground-mounted solar PV farms, like community solar projects). Following a period of relatively steady and sizeable declines, installed price reductions began to stall around 2005, as the supply-chain and delivery infrastructure struggled to keep pace with rapidly expanding global demand. Beginning in 2008, however, global module prices began a steep downward trajectory, and those module price reductions were the driving force behind the decline in total system prices for PV from 2008 through 2012. Since 2012, however, module prices have remained relatively flat, yet installed prices have continued to fall as a result of a steady decline in non-module costs. “Modules,” if it’s not clear, are the panels themselves. “Non-module costs” are everything else. About 20 percent of the drop in non-module costs came through cheaper inverter and racking equipment. The rest came through “soft costs” — finding new customers, installation, maintenance, regulatory compliance, and various other administrative costs. With module prices flat and subsidies declining, most future cost reductions will have to come through soft costs. That’s a crazy wide spread. The report has several chapters devoted to explaining these variations — from installer to installer, state to state, customer-owned to third-party owned, retrofit to new build, different efficiencies and power electronics, and so on. But the overarching point is that soft costs can be brought down much further just by everyone converging on current best practices. Since module prices are pretty standardized the world over, almost all this international variation comes down to soft costs. The US can clearly do better. There’s lots more to draw from these reports — for instance, module efficiency is improving, and so is the average capacity factor of utility-scale PV plants — but that’s probably enough charts for one day. 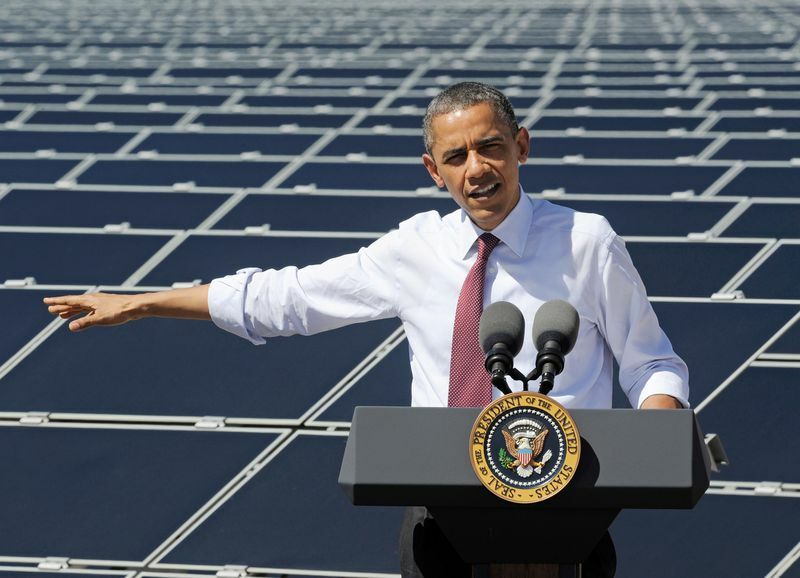 The TL;DR version of all this is that the price of solar power continues to steadily decline in the US. There’s a good argument to be made that it needs to declinemuch more, and faster — there’s definitely no room to sit back and coast — but at least for now, the news is, provisionally, good.